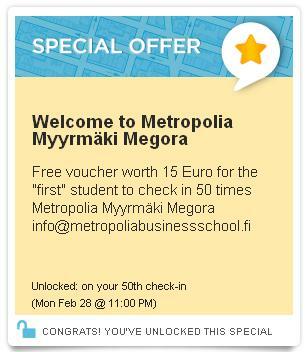 Metropolia Business School has launched a Foursquare University page which can be found from here. Foursquare is a location-based mobile platform popular in America which is catching on in Europe. Foursquare offers “checking in” via a smartphone app or SMS, users share their location with friends while collecting points and virtual badges. While we are not sure if Foursquare will prove to be so popular among Metropolia students we thought it worth while to try out and see. Metropolia Business School believes in the power of our community of teachers, staff and students to make education both motivating and enjoyable for all. Foursquare provides us with the ability to engage our community, go beyond the classroom to provide a wealth of information on the exciting learning opportunities happening in our campus and assist you in joining in for the betterment of our community. Metropolia Business School has taken charge of the main Metropolia Myyrmaki page and added the following pages: library, canteen, gym/sports hall, A-Auditorium and Megora social centre. Students will be able to checkin and unlocking badges in each venue. For our first ‘special’ we are offering a 15 Euro voucher for the first person who manages to checkin 50* times in Myyrmäki Megora venue. Follow us on Foursquare by clicking the image below and let us know what you think of our Metropolia/Foursquare idea by answering our poll.